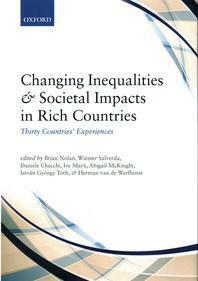 서명/저자 Changing inequalities and societal impacts in rich countries : thirty countries' experences / Brian Nolan ; Wiemer Salverda ; Daniele Checchi [et al.]. 발행사항 Oxford : Oxford University Press , 2014. 일반주제명 Income distribution--Developed countries--Case studies.